Dianella 'Big Rev' is medium sized Dianella revoluta. From a distance, Big Rev has blue tones to the foliage. On closer inspection, one side of the leaf is blue and the other is green, this gives it a unique colour. Dianella 'Big Rev' puts on a show with an abundance of beautiful blue flowers from mid spring through to early summer. This is followed by purple edible berries. 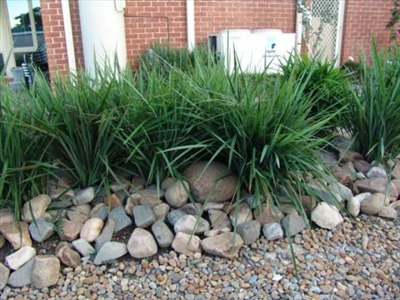 It will spread slightly over time, however for this reason, it is good for situations that need erosion control. Its large rhyzomes stabilise the soil. It also belongs to the No Irrigation Gardening Range, which means that once established, it can survive on natural rainfall in many areas. In very extreme droughts, occasional watering may be required. It tolerates windy and salt laden windy positions and is very drought tolerant. Excellent landscape plant either single specimen in gardens or mass planted in commercial or large gardens. Great for containers too. Good understory plant.